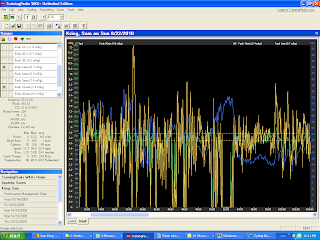 Training and Racing With a Power Meter Journal: Tour of Utah- Last Stage observations-Hardest race of year! Tour of Utah- Last Stage observations-Hardest race of year! This is a great quick analysis that one of the coaches in Peaks Coaching Group did on his race at Tour of Utah. Sam Krieg is not only a great coach, but also excellent Category 1 racer! I really enjoyed his analysis of his race and also thought you might. - Hunter. A look back at 2010. The hardest day I had all year. Just a quick look at the start of the last stage. I remember this as a very hard start. So hard I wanted to quit. Looking at the file I understand why. When you look at wattage from races the numbers never look that bad. After you read this… get on the trainer or head out to the roads and try to ride similar efforts. I can honestly say that this was probably the hardest I have ever gone. I have ridden better numbers but it is all relative. I have never gone this hard on a bike. The first 30 minutes of the 5+ hour stage were 297(4.5 to KILO) watts avg. BUT THE NORW was 329. To give you an idea of what it felt like I have to say it was like the start of a Pro 1-2 crit right from the gun. Then we hit a climb and it was single file. The last few minutes of the climb I was riding on the rumble strips going absolutely 100000% just not to get dropped. It was awful. I remember looking back and there was no one behind me. Just team cars and motorcycles. The PEAK 5 and 10 minute were at the end of the 30 minutes. So we basically rode a 20 minute MICRO BURST workout… took a short rest then HIT IT for 10+ mintues ALL out. The 2 minute PEAK was at the end of the 10 minute. I was on the RIVET the entire last 10 minutes. We still had 4.5 hours of racing and I was maxed. This was in Park City at 7000ft and the 5th stage. I pretty much was the last guy over the climb. I barely made it. 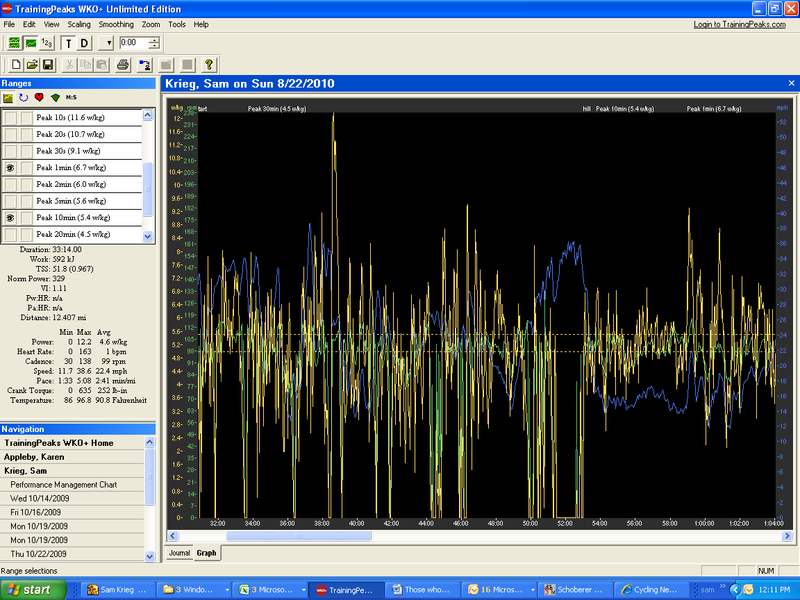 Later in the day I was dropped on a climb where I was riding close to 5.3 watts to kilo for the first 10 minutes. I couldn’t even stay in the main group.